← Do you have an electric car? 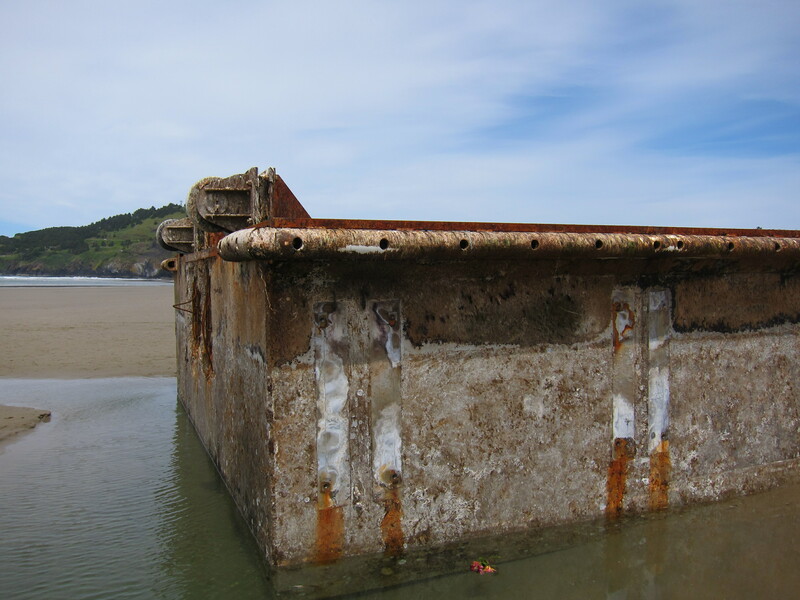 On June 7th the local paper announced that a massive section of a floating dock set free by Japan’s tsunami had washed ashore on the Oregon coast. The earthquake and the following tsunami happened in March 11th, 2011. 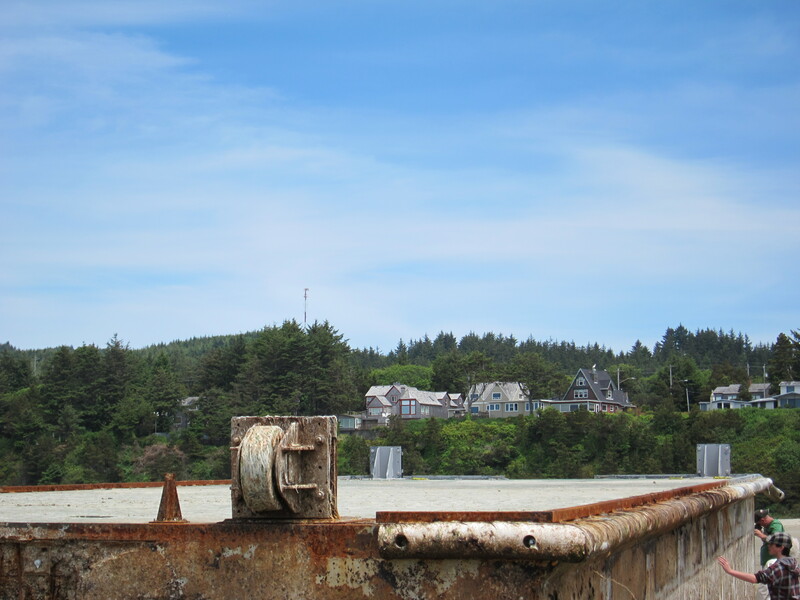 This floating dock went through a long journey drifting across the vast dimensions of the Pacific before arriving at Agate Beach, Newport, on the Oregon Coast in the first week of June 2012. It took almost exactly 15 months for it to make the cross. I was on my way to Wenatchee, last Thursday, when this was reported, so I made a plan to go check it out as soon as possible when I returned to Eugene. Sunday morning I picked my favorite mode of transportation to make the journey to Newport. 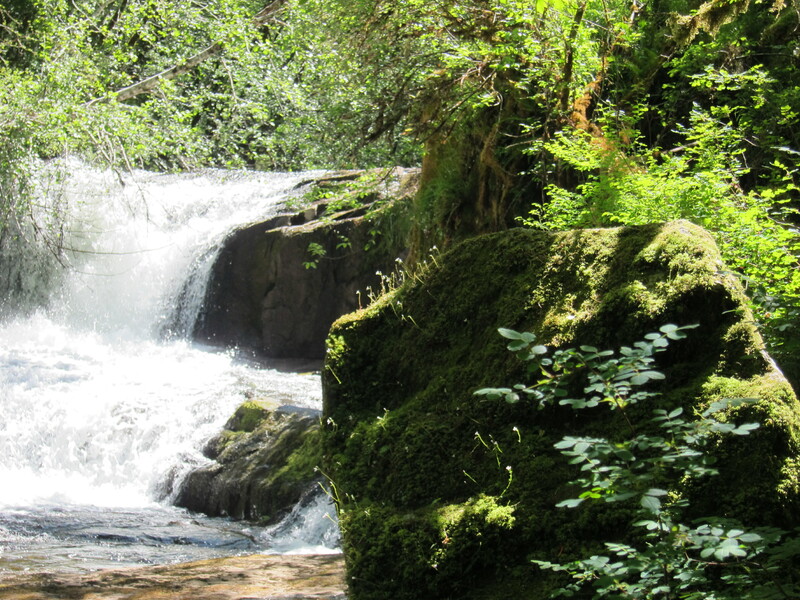 Following a variation of my usual ocean loop, I took Alpine Road and made a stop to check the Alsea falls. I don’t know if there is more to these falls. I didn’t want to arrive too late in Newport so it was a quick look, some pictures, and I was back on the road. From there I went to Alsea, then Waldport via 34, and finally went north to Newport via 101. In Newport, from Nie Beach you can barely see the action at Agate Beach, where this big chunk of concrete had run aground. 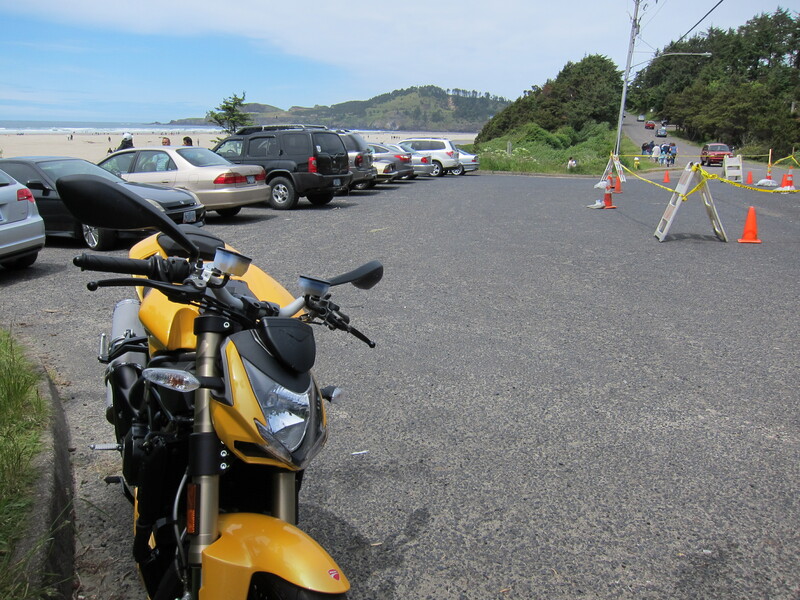 When I got to Agate Beach, the small parking lot was full. Traffic was not so bad, but you could tell something out of the ordinary was happening. It was clear to me where the dock had run ashore. I just followed the crowds. I could not see it, but I knew where it was. 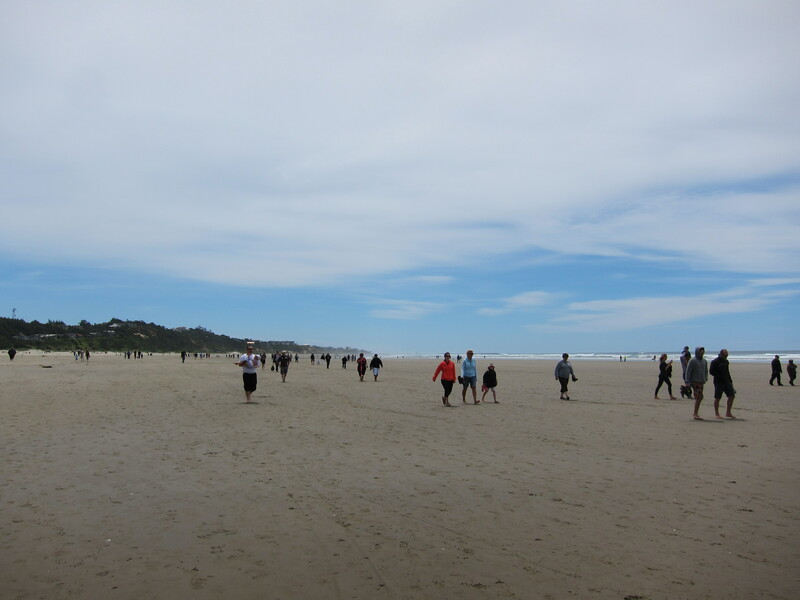 It was like pilgrimage, and I was not surprised people were doing this: I was one of them. From an observer at this distance, we looked like ants surrounding a bigger, dead bug. People were there to touch it, photograph it. See it up close. Stare at it in silence. I did all of that. It reminded me of the end of the 1977 film “Close Encounters of the Third Kind” as I saw people appreciating this massive, foreign structure that arrived on our shores on such an unorthodox way. Well, unorthodox is the object and not the way it traveled. At least that was how I was experiencing this encounter. A massive structure it is. At 20 meters long, about 6 meters wide and 2 meters tall, it is one of four pieces of floating docks that have taken to sea after the earthquake and tsunami. 60 meters long by 6 meters wide by two meters tall. The whereabouts of the other three docks are unknown at this point. They could be on the bottom of the Ocean somewhere; they could be floating our way or towards other locations on the west coast of North America. 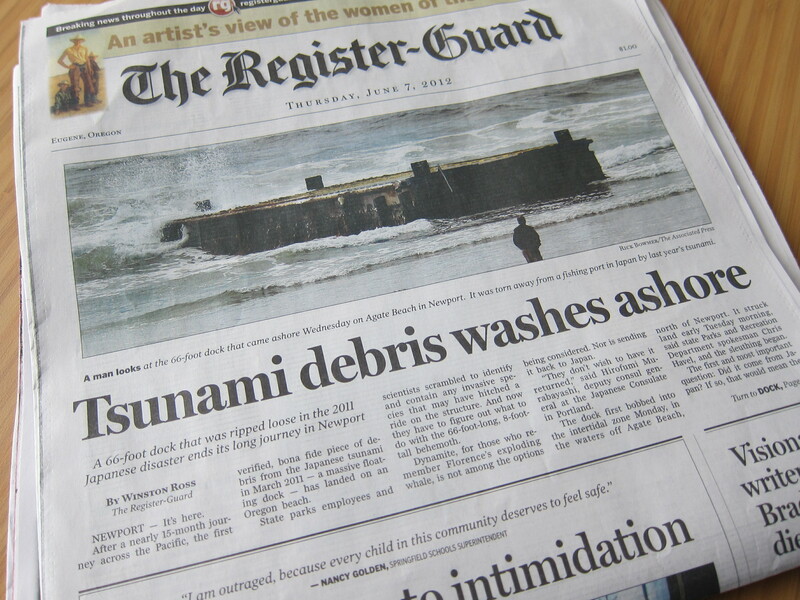 Japanese authorities have indicated that there may be 1 to 2 million tons of unaccounted debris still drifting away on the Pacific. We already know of a container, with a very wet, but otherwise intact Harley Davidson motorcycle inside of it, that ran ashore somewhere in British Columbia, Canada. 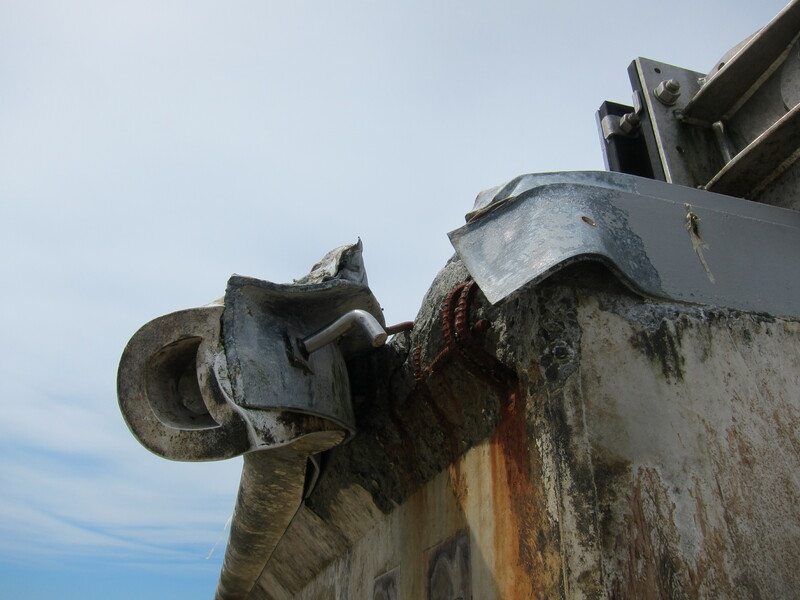 And we also know about an empty Japanese fishing boat, dubbed the “Ghost Ship,” that was purposefully sunk by the US Coast Guard because it was adrift on shipping lanes off the United States and Canadian coast. 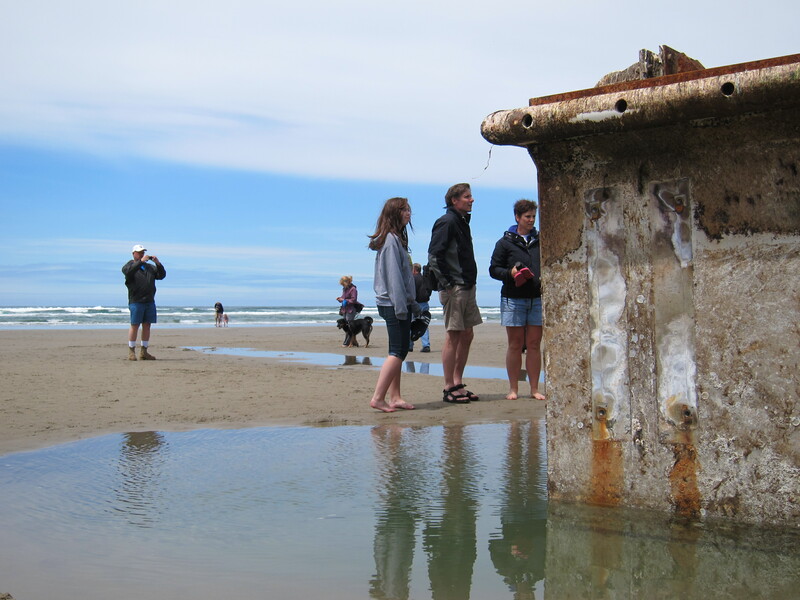 In what concerns to Oregon, officials are trying to figure what to do with this big chunk of concrete. There has been talk about dismantling it in place to dispose of it in pieces. Another alternative is to drag it back to the ocean and tow it to some place secure, and then dismantle or perhaps sink it. The bigger unanswered question at this point is: who is going to pay for this? 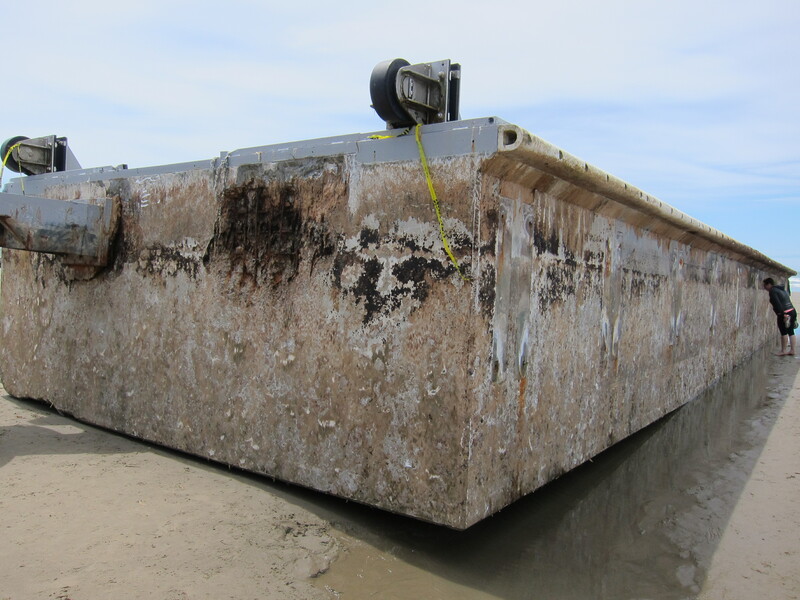 Meanwhile, biologists have assessed the species that were attached to the structure and have sterilized the entire structure to prevent invasive species from establishing themselves in this area. Which makes you wonder in natural events past, before humans’ existence, how many pieces of materials, such as tree trunks, may have drifted this vast ocean, with other species attached to it, and helped colonize America’s flora and fauna? And after humans invented floating devices? If you read my post about American Samoa, you know a little bit about my thoughts on this. I’m glad I made this trip. 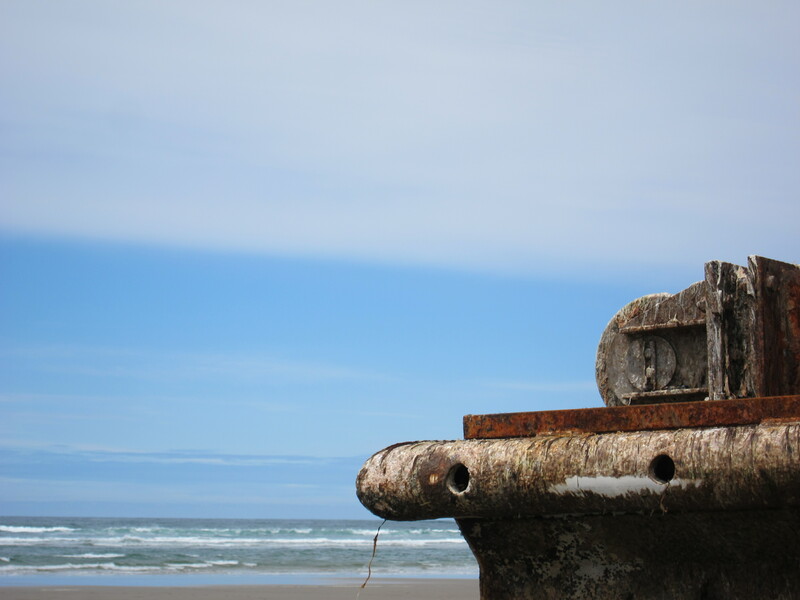 It was quite an experience to see this vast structure up close, while trying to imagine how it drifted for 15 months before it finally hit the Oregon coast. 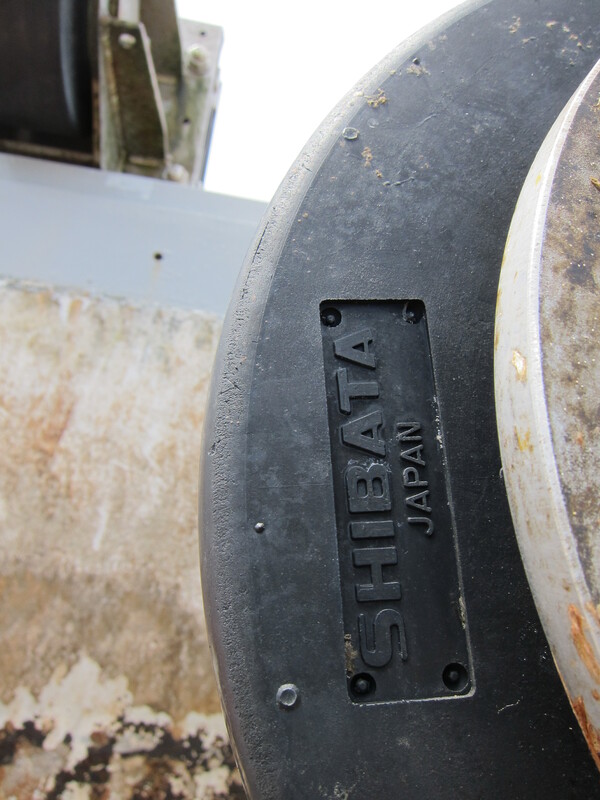 It attests to the Japanese quality of construction. 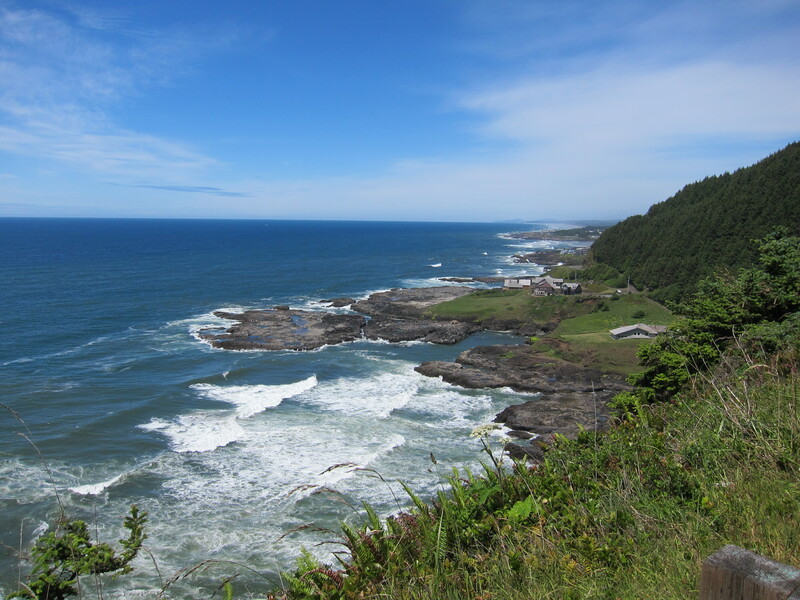 And you should know that the Ocean is not the only nature’s conveyor belt transporting materials from Japan to the America’s and more precisely Oregon. 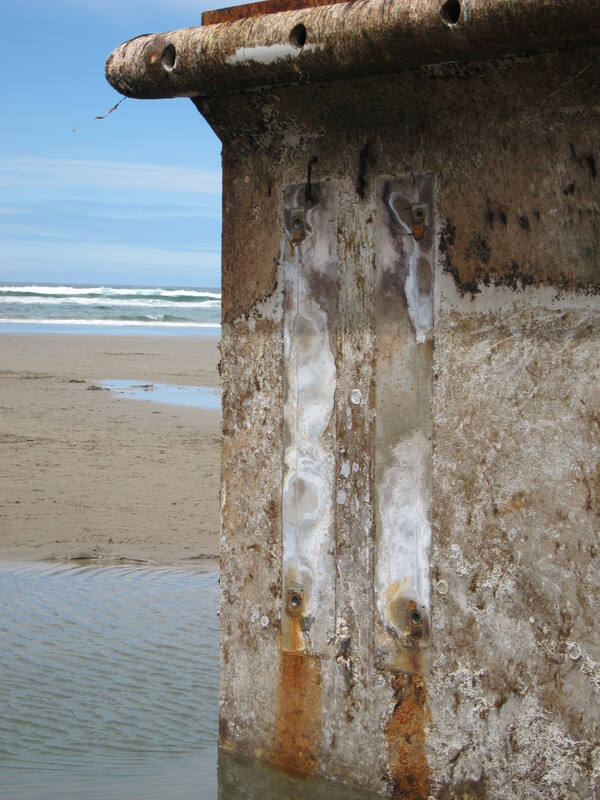 Eventually I will put together a report on another story to report on another object that made use of the jetstream to fly from Japan to Oregon, arriving here in May 1945. With these thoughts in mind, I hopped back on my bike and made my way back home riding 101 south to Florence and from there 36 back home. 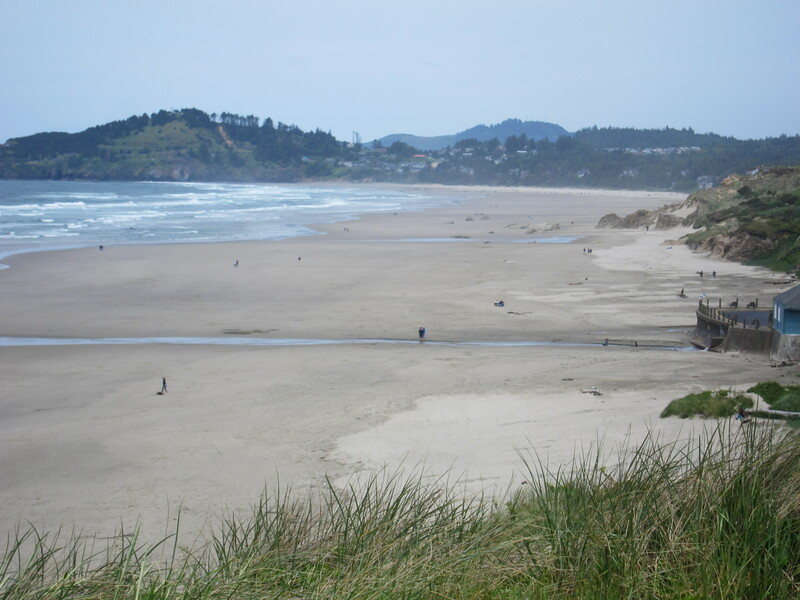 Looking north, towards Yachats. 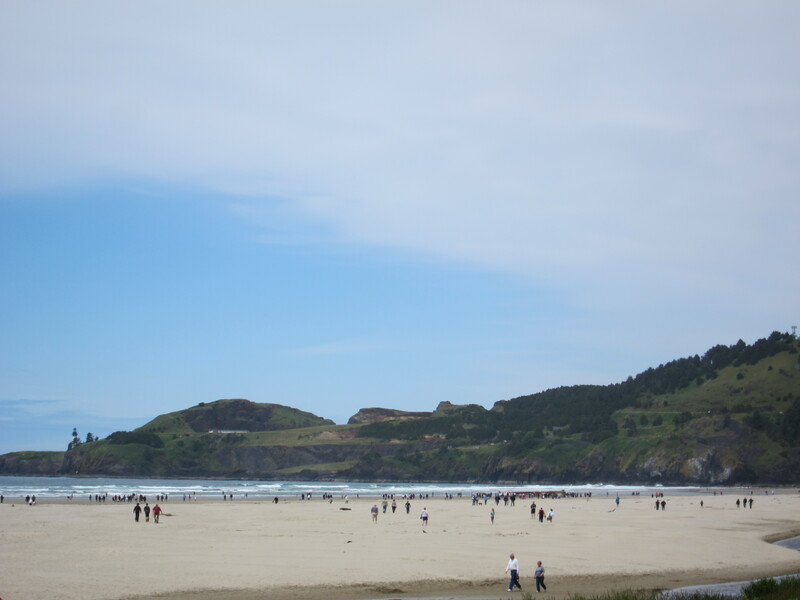 Oregon Coast, June 10th. A total of 233 miles (372 km). I was really tired this time around. The allergy season is here and I rode through areas that made me sneeze nonstop. I could not wait to be back home, go inside and rest. Back home. Another mission accomplished! June 10th, 2012. If something else of such magnitude arrives nearby, I will go check it again and report here. Meanwhile, thank you for reading. 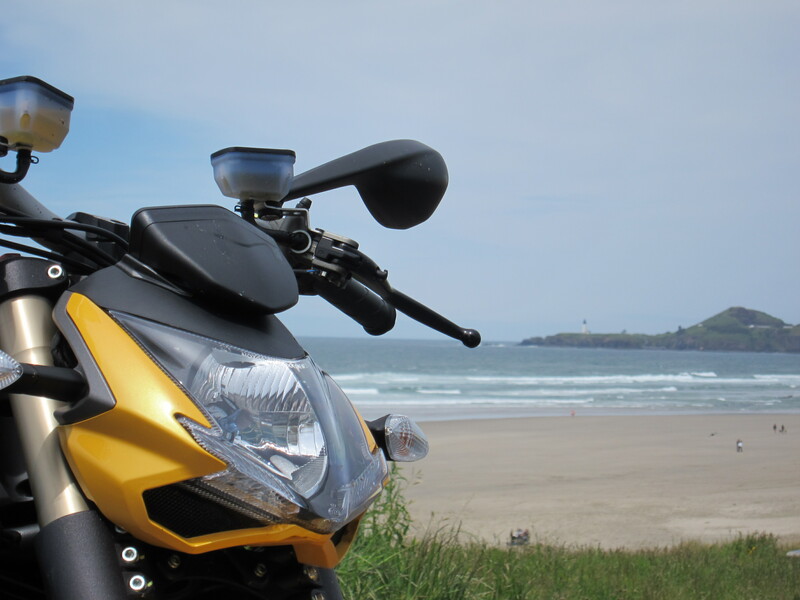 This entry was posted in Riding the Ducati, Travel and tagged agate beach newport, alsea falls, Ducati, floating dock, japan, Oregon coast, tsunami. Bookmark the permalink. 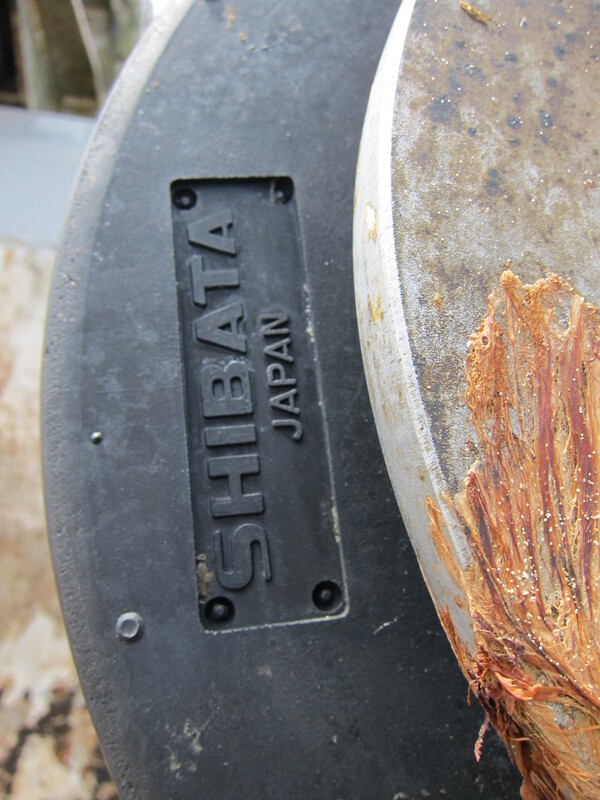 Isn’t that eerie thing that the debris from Japan starts showing up at our beaches? Everything is connected, if a disaster happens in one part of the world doesn’t mean that you are safe in the other part. 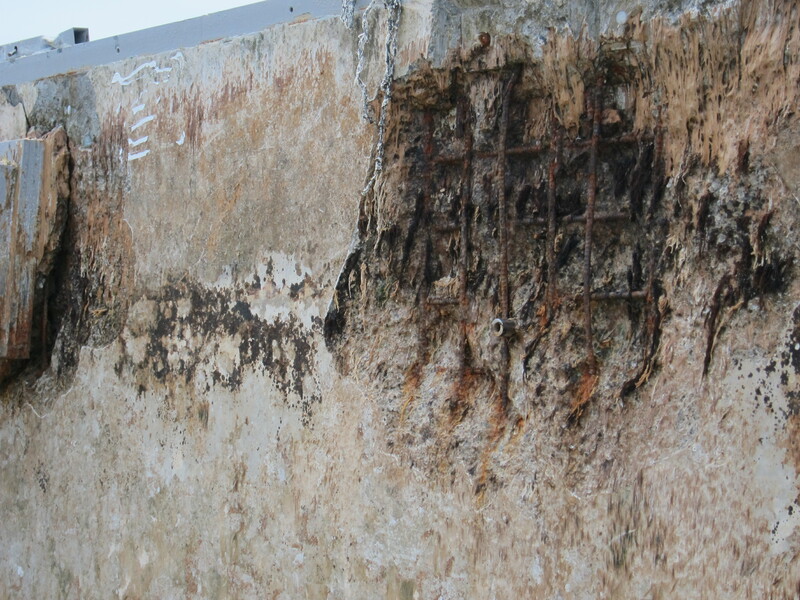 If concrete could talk, what would it have to say about its journey? 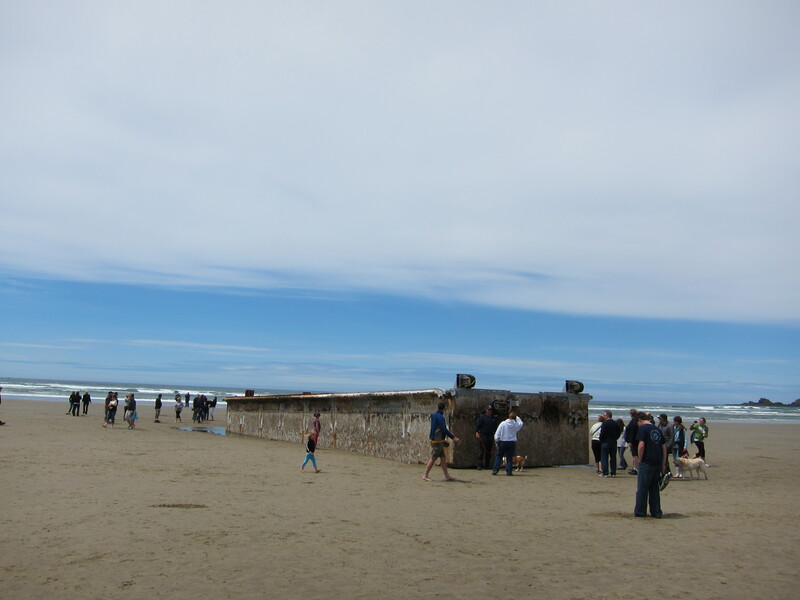 Maybe if it is reasonably safe, it could remain on the beach as a reminder of what happened. 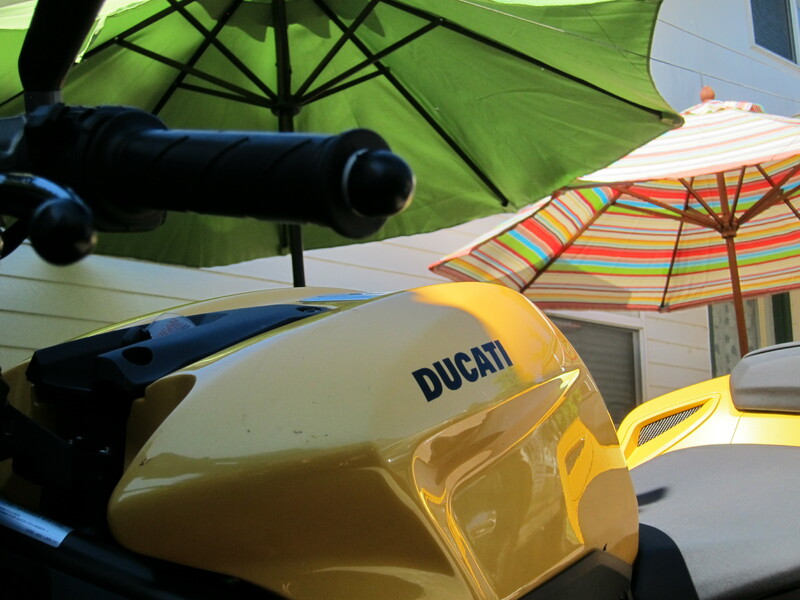 Your bike looks awesome, as usual, I guess yellow just the perfect colour for a bike like this. Yes we are all connected. And this should be a good thing, with scary moments in between, but with a good final ending. Thanks about the compliments on the motorcycle. I really like that little machine. It is not a perfect machine, and that’s probably why it is so nice. It keeps me on my toes. I’m glad we have our OWN roving reporter with camera. It’s sad that all we can think about is how much money to get rid of all this debris, when thousands in Japan have no homes. It’s actually a good thing it ended up at Agate Beach. Imagine it crashing on the waves at a more rugged coastline. It would do more damage to our environment. Yellow is also a very attractive colour. I am magnetized to it. I agree with you… looking from a distance, to be worried about the costs of cleaning up does not look nice when one compared to the cost of rebuilding at least one home in Japan. But I think they are more concerned about what account the moneys will come from than its value (at least I hope that is what it is). Second problem is about deciding what to do with it. Yes, I went to Wenatchee, and I flew there – it was a work trip – and that is the report I have here. My comment on that post was that after been to Wenatchee, it would be nice to one day be back there, but instead of flying, riding my motorcycle. 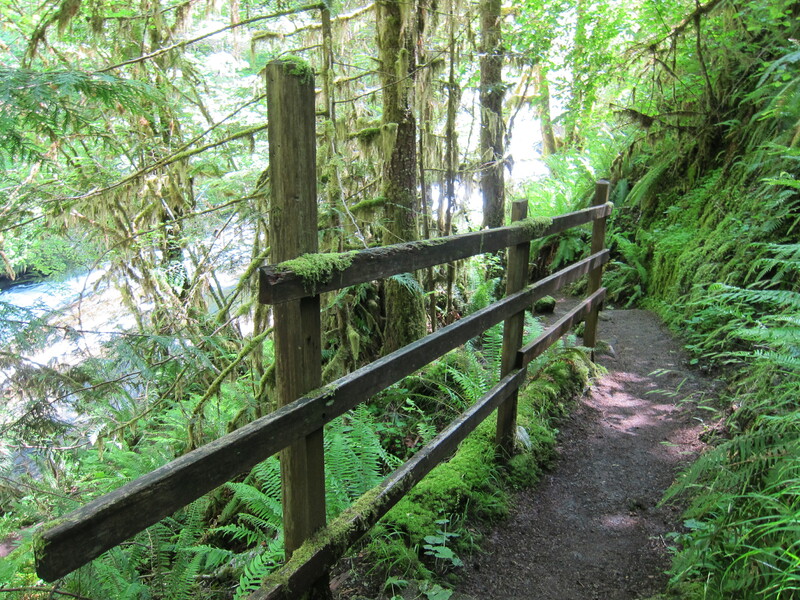 That will probably happen when I do the WA-Back Country Discovery Route. Maybe next year, by the look at things. And yellow was the color of my first bicycle. I’m glad to have this motorcycle in yellow, it looks great no matter what is the background. I’m considering picking up a Streetfighter 848 myself next weekend but am definitely a little concerned about the “surging issue”… I read your other post where you said it disappeared after some fiddling with DTC. Has it come back at all since? I’m still not sure it was the DTC change that I made that made the difference on the acceleration fluctuation, but at 250 miles something changed. The smoothed out very clearly at that point in time. 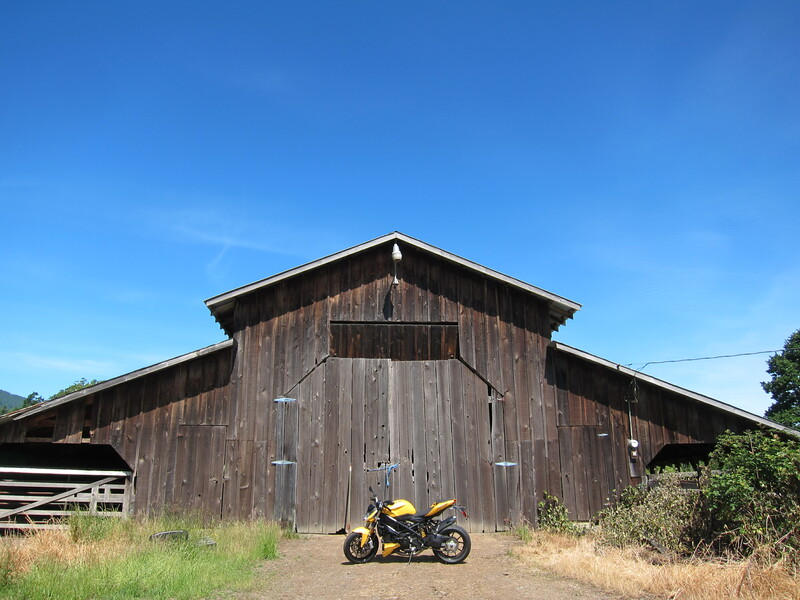 The bike continues to improve, but it is not perfect, now it has 1,000 miles. I would say your decision should depend on what type of riding you do, and where you will be riding the most (city traffic or open road). I would venture to say that all fuel injected Ducatis have problems at the 3-4,500 rpm, due to lean mixtures at those rpms (air/fuel mixture graphs show it clearly). Some are worse than others, the SF 848 is not so bad, but it is there as well. Like all Ducatis, I see them more suitable for the open road than for city traffic. The best way for you to make a decision is to take one for a test ride. They should be available on almost every Ducati dealer at this time.